...for safe sheep! Yesterday morning I set my alarm so I could get up and go jogging before church. I truly dislike getting up in the dark, but when the day length is so short, it's that or often nothing. SO, I got up and got dressed, and in the process happened to glance out our bedroom window. 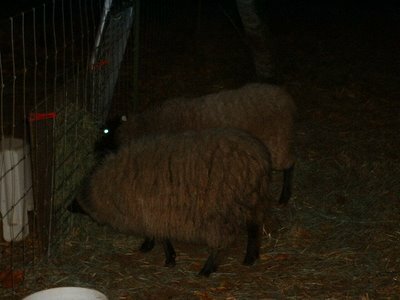 There, in the predawn gloom, were my sheep, wandering around on the driveway near the barn! My first thought was that something had tried to get them in the night and in their panic, they had managed to get out of their nighttime quarters. But they looked okay, and when I got down to the barn, I saw that their pen gate was wide open and their evening hay was untouched. Obviously, Rick had forgotten to shut their gate after bringing them in with alfalfa pellets, and they had been free all night! I stifled the thoughts of what COULD have happened in the night, and put the girls in their pasture with an early breakfast. They were wet from fog and heavy dew and not terribly hungry after being free to browse, but otherwise fine. I told each of them -- and the Lord -- how thankful I was that they were okay. 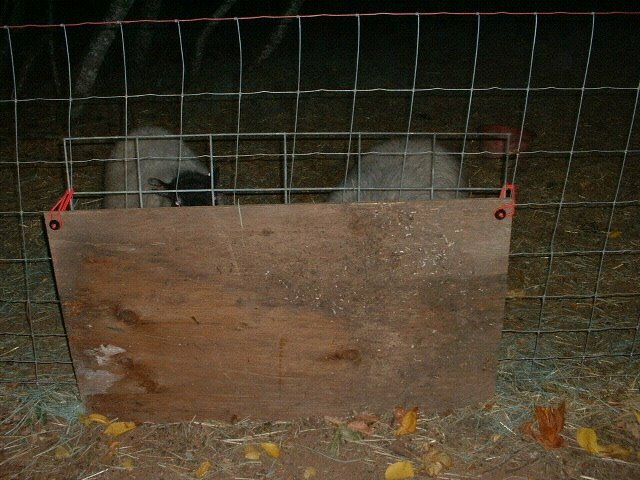 Did you notice my quick and dirty adaptations of Jim and Susie Sizemore's wonderful hay feeder design (see "Enjoyable visits" under Previous Posts)? 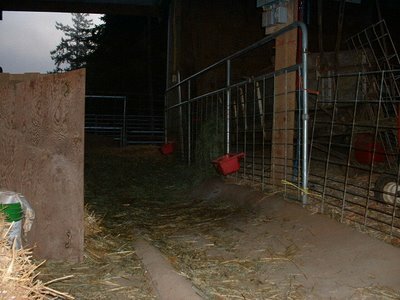 I was tired of how much hay the girls waste, and don't know when we will get their new fold completed with it's copy of the Sizemores' feeder. 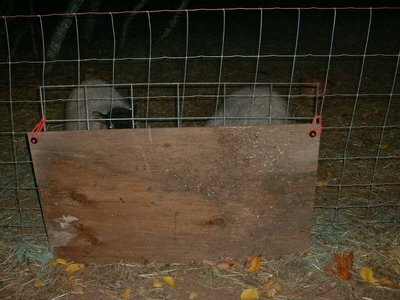 So I rigged these up with pieces of plywood, "ball bungies," and an extra piece of fencing panel (to make the openings smaller) for the pasture feeder. I'm very happy with how they are working! 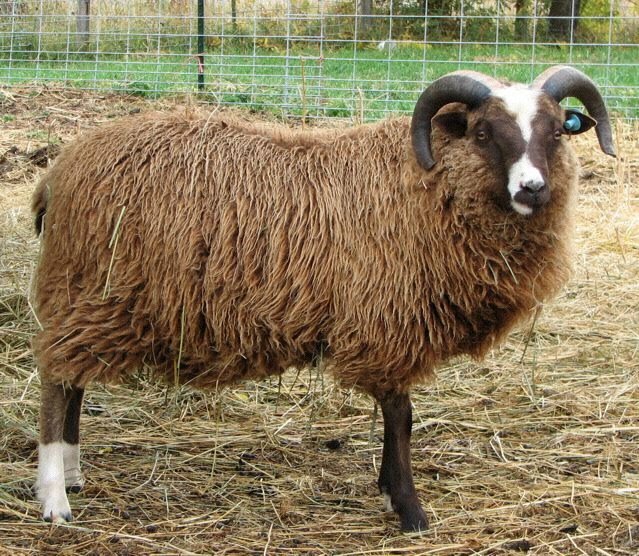 You've met my beautiful Valentine, a light moorit (that's brown in Shetland sheep lingo). As I type this, Valentine may be getting acquainted with her handsome beau, Clarion, over at Lois Moore's Stonehaven Farm. As you can see, Clarion is a darker moorit, as well as having smirslet/sokket markings (that's the white on the head and legs in Shetland sheep lingo). 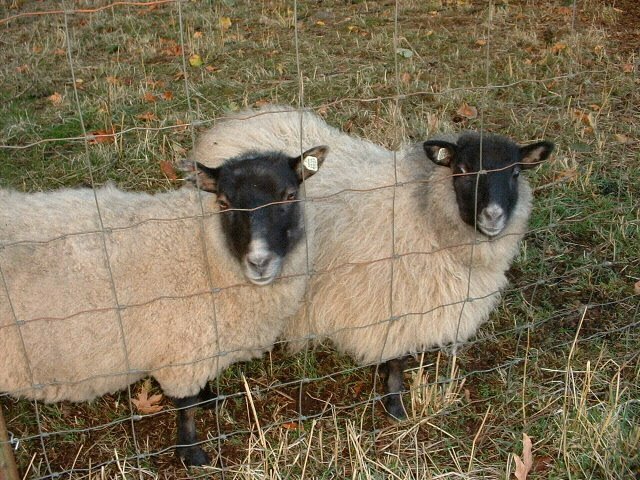 In our first lambing season, our two ewes each reproduced her own color. It's a sure bet that Valentine will do the same, since moorit is recessive to all other colors and therefore the guaranteed outcome of breeding two moorits. She can only surprise me with the SHADE of brown, as well as whether or not Clarion passes on any of that chrome. 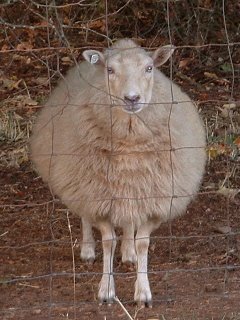 Whatever we get, I'm sure the lambs will be beautiful -- yes, even though they will be brown! 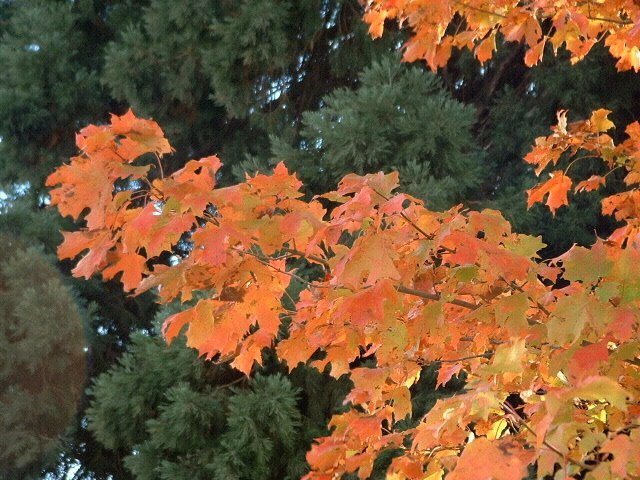 The leaves are changing colors, and I revel in their beauty. 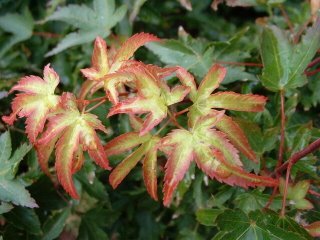 Below is one of my little Japanese maples. Last Friday's quote on my Mary Engelbreit desk calendar said, "Autumn is a second spring when every leaf is a flower." (Albert Camus) Isn't that great? Through Friday we were enjoying a beautiful Indian summer, with cool nights and warm days. But there was still that quality in the air that said Fall had arrived, even though the thermometer said "Summer." 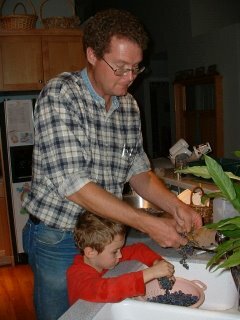 Rain came over the weekend, so yesterday we worked on indoor tasks, like installing a new dishwasher and making grape juice. 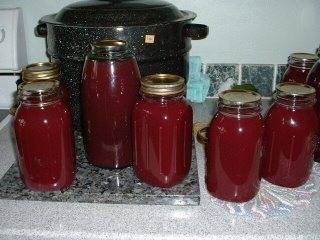 A client of Rick's has grapes, so this was our third or fourth session of bottling the lovely stuff. The variety he brought home this time was concord, although the grapes weren't as ripe (and therefore as dark and sweet) as they can get. But it's still beautiful, no? 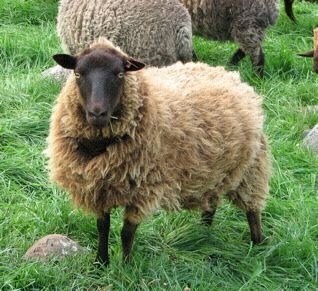 The sheep are busy eating and growing wool. I look at that wool in a different light now that I'm spinning it. It's not just what sheep grow for covering, it is a gift they are producing. And their production has gotten me back into producing gifts myself. It's something I used to do all the time as a matter of financial necessity as well as personal satisfaction, but I haven't found much time for it since Brian was born. 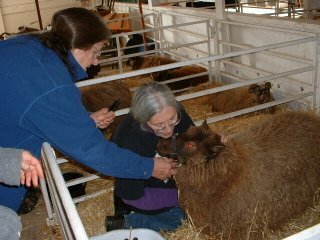 Between the enjoyment they give me as pets, the fleeces they produce, and the inspiration they have provided, my little sheep have given me so much! They truly are a blessing. 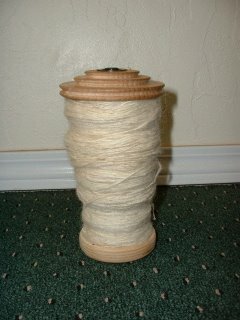 By the way; I've filled my first bobbin with Dinah's breech wool - all 5 1/2 ounces of it! I'm pretty happy with my first spinning efforts, and love doing it. 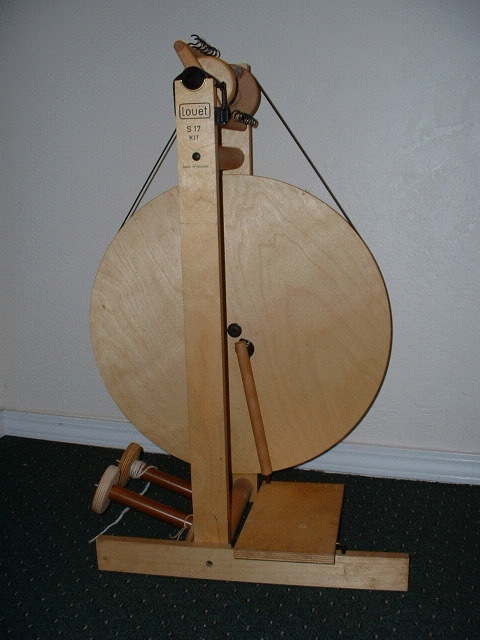 Now I've got to figure out my next step, be it plying, making a skein or a center-pull ball, dying . . . I'll let you know what happens! After being up to my eyeballs in alligators for the last couple weeks, I'm coming up for air long enough to share "the rest of the OFFF story." As I stated in OFFF, Part I, one of my objectives in going to OFFF was to learn to spin. Even though Lois had plenty on her own plate (that's her in the sheep pen, below), she graciously set me up with both her Ashford and Schacht wheels and patiently worked with me as I made my first frustrated attempts. It wasn't easy and it wasn't pretty, but I did manage to spin a little (and ply a little), and have a tiny, lumpy-bumpy ball of handspun yarn to prove it! Spinning didn't come as easily as I had hoped, but the challenge made me even more determined to master this tricky craft and be able to spin the fleece of my own dear sheepies. Lois advised trying as many different wheels as possible. I only had time to try a Louet at a vendor's booth at OFFF, so I blocked out a couple hours the following week to go to Woodland Woolworks, a local business with a large inventory of new and used spinning wheels. There I tried an Ashford, a Lendrum, a Fricke, a couple Kromskis, another Louet or two, and more. Some were quite seductive in appearance, but the Louets were by far the easiest and most comfortable to me to use, and I liked their uncomplicated design. 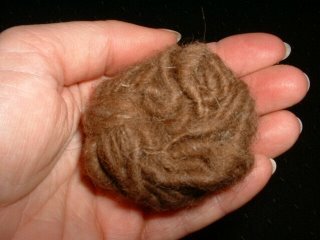 I stewed and chewed for several days, but finally bought the inexpensive, used Louet S17 Woodland Woolworks had, along with some inexpensive roving to practice with. Meet Louie! Louie and I haven't had time to get further acquainted since I got him home, but he's waiting patiently. I had to work at my husband's veterinary clinic last week while his secretary was on vacation, so I DID get to wash Dinah's fleece and Rechel's rooing in the top-load washing machine while there. 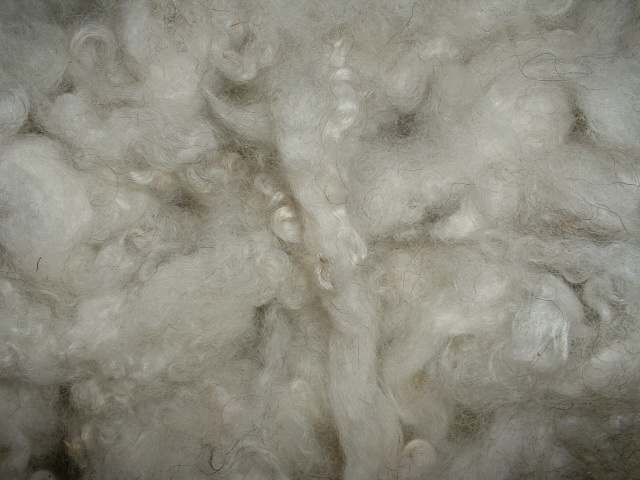 The fleece still needs to be carded, but the rooing (below) is soft and beautiful and begging to be spun as is. I hope I can do it justice!